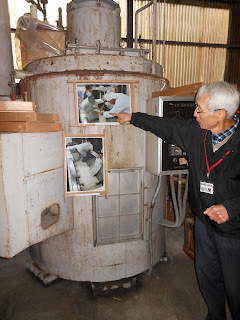 I was invited to tour the Mt. 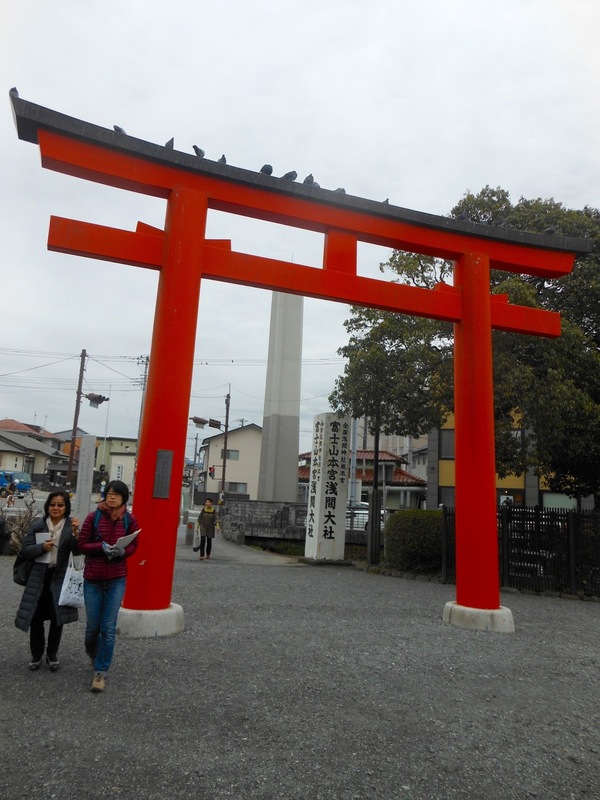 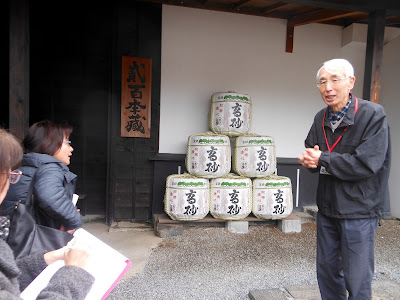 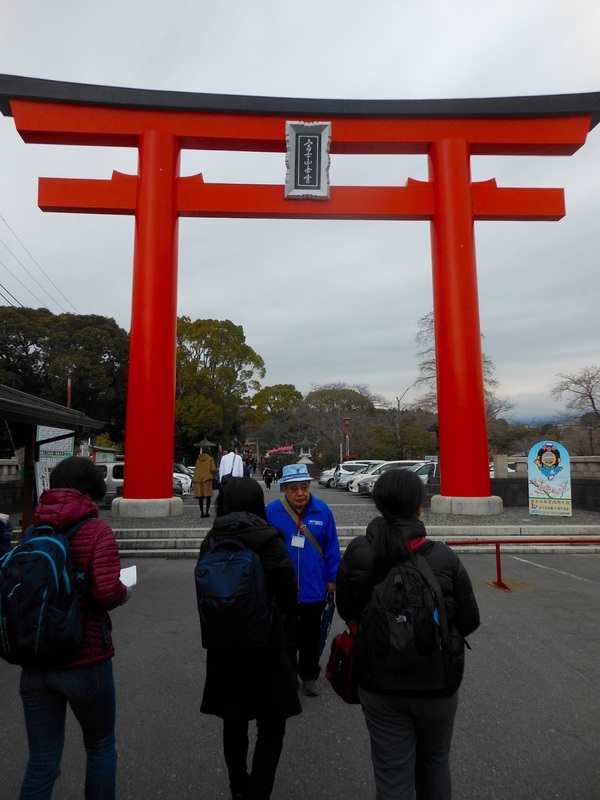 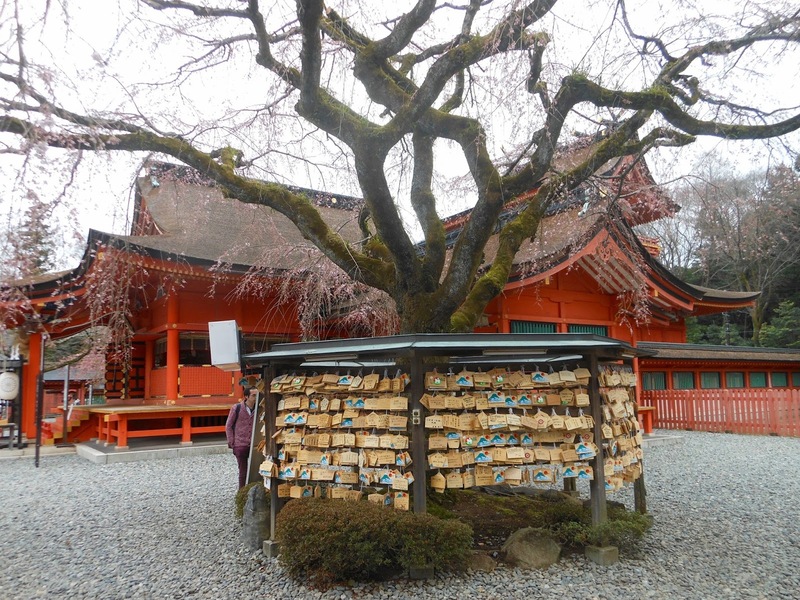 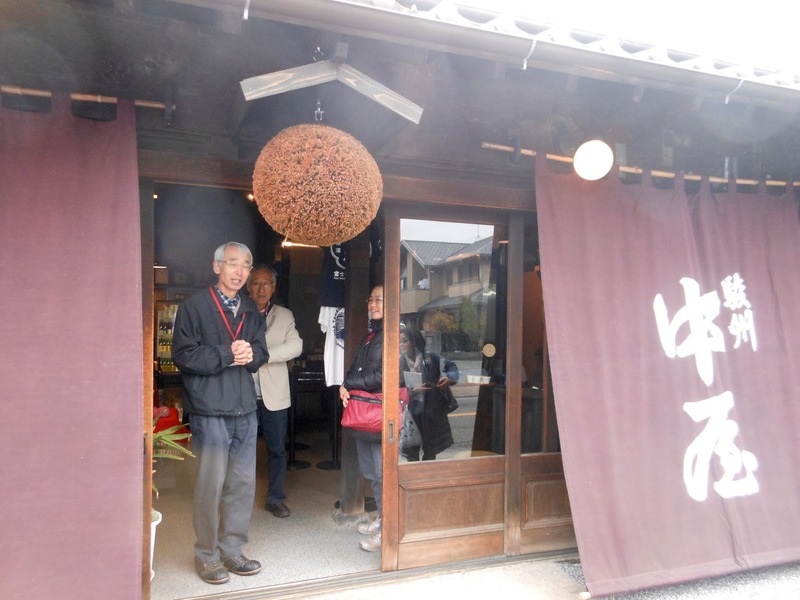 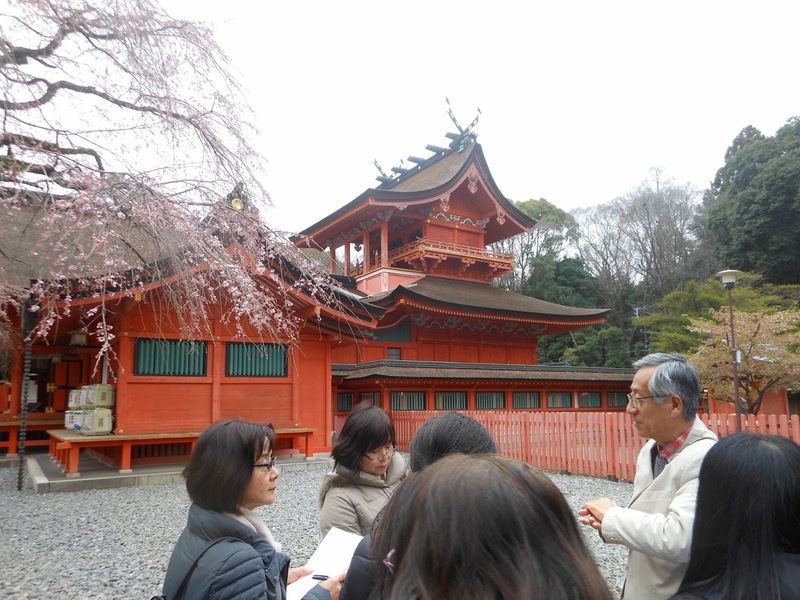 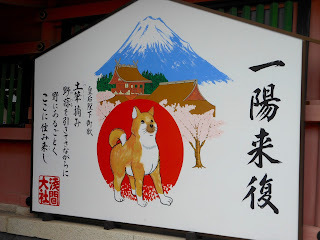 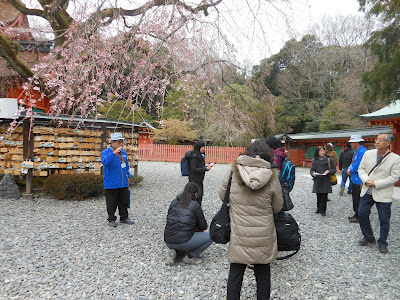 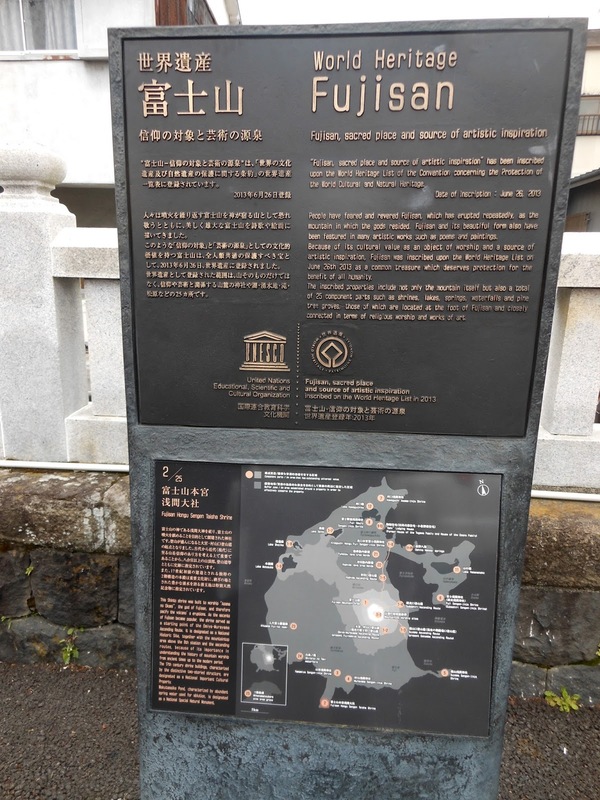 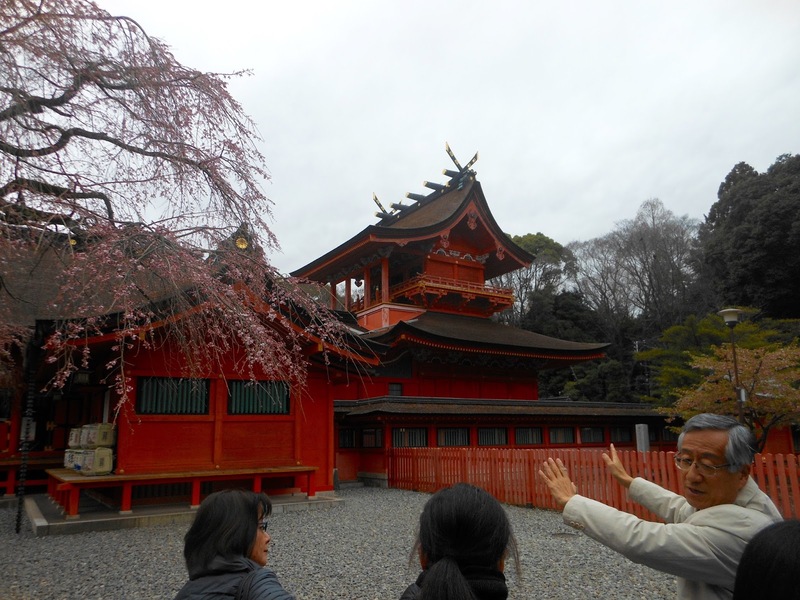 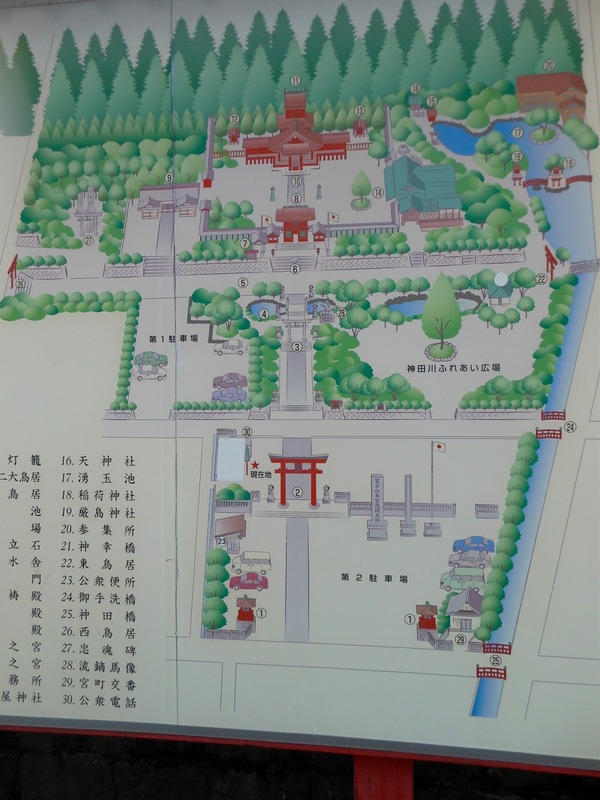 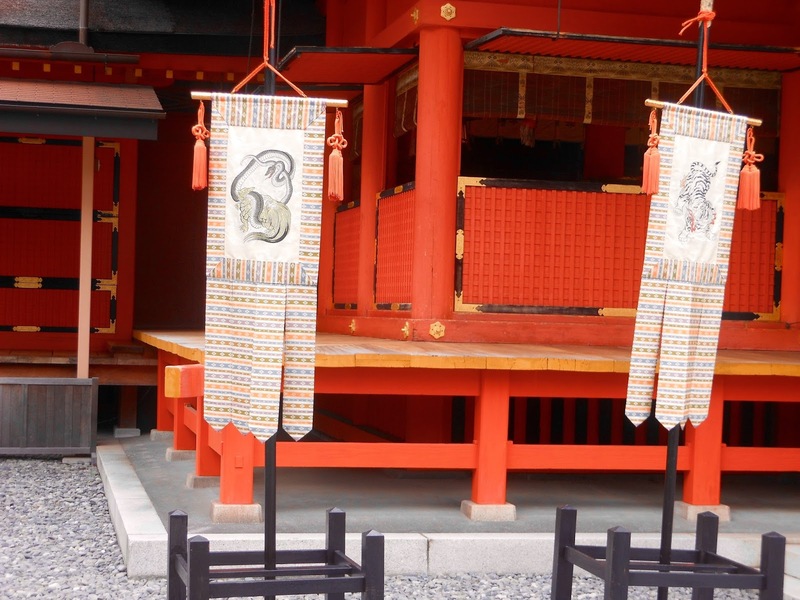 Fuji World Heritage Center, the Fujinomiya Sengen Shrine, and the Takasago Sake Brewery, as well as eat lunch at a Yakisoba Restaurant with a group of nine volunteer multilingual guides. 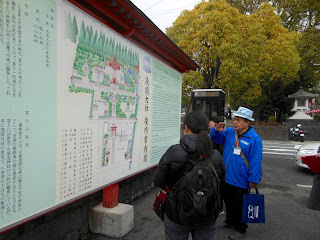 They took turns giving me a whispered translation of the Japanese language information at each place. 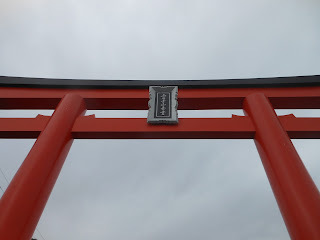 (I posted about Mt. 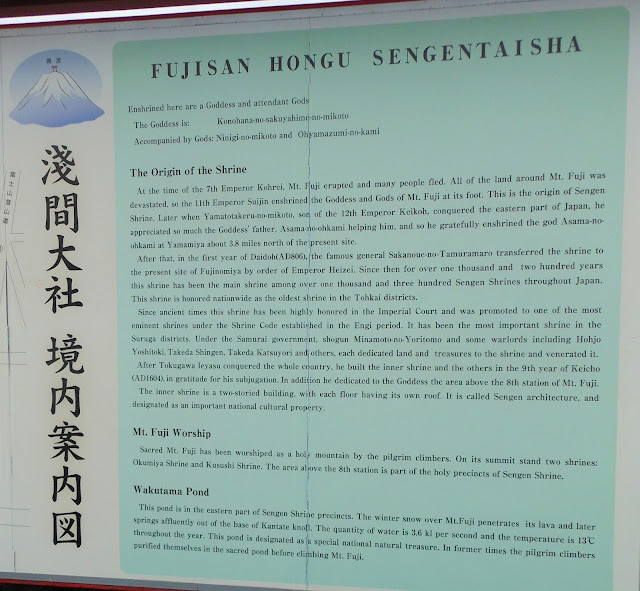 Fuji World Heritage Center and lunch on Sunday). 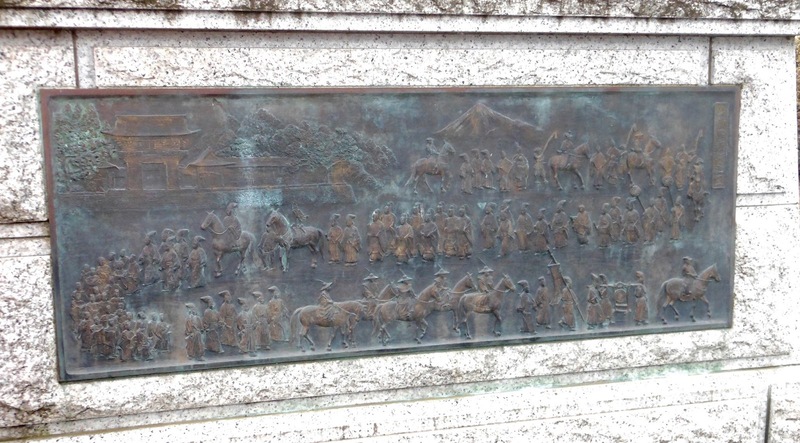 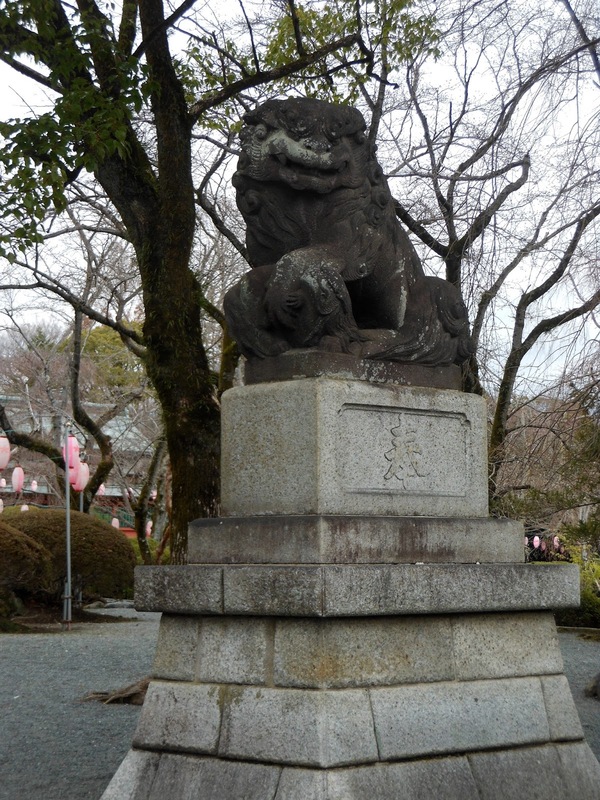 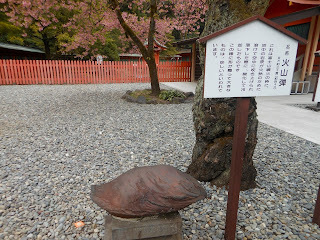 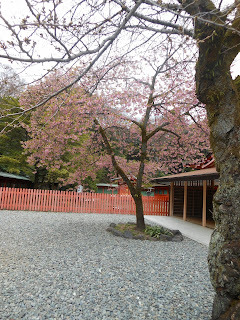 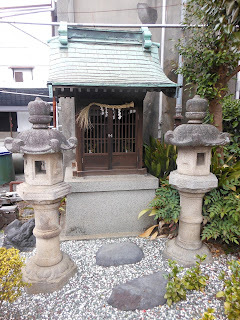 (I visited this shrine before and posted about it here.) 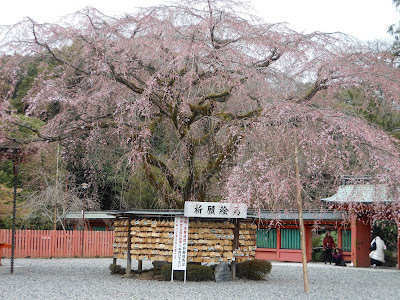 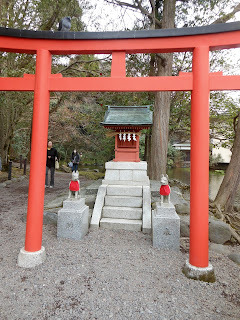 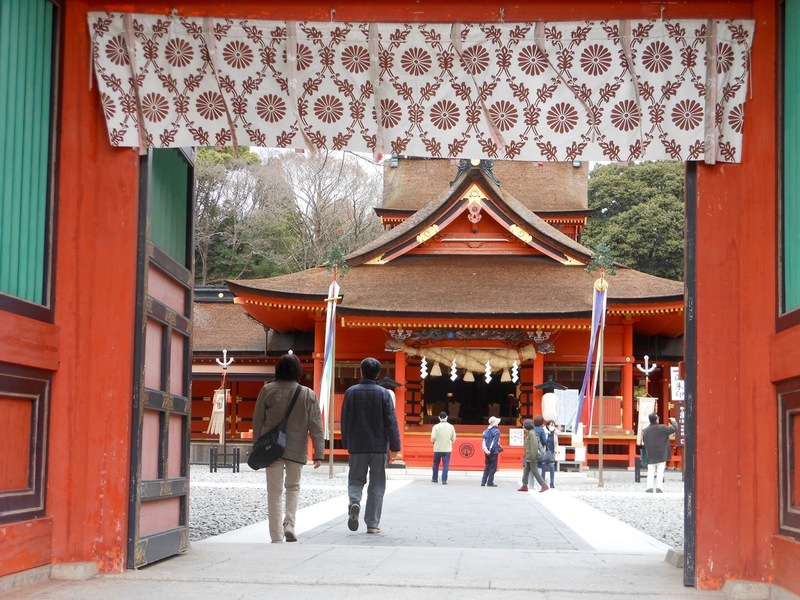 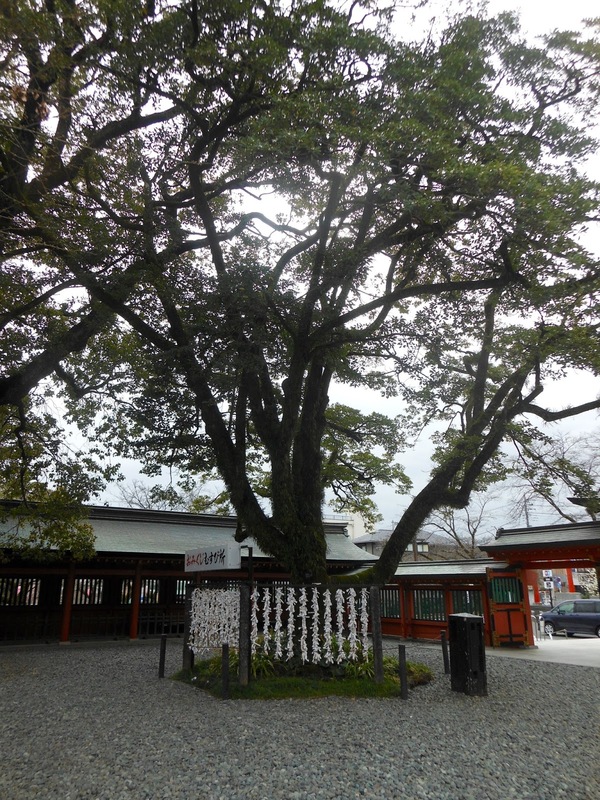 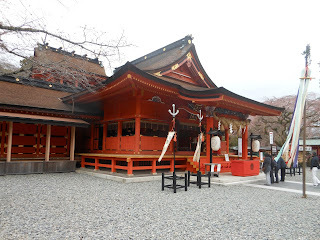 This is the head shrine of about 1300 Sengen Shrines and is about 1200 years old. 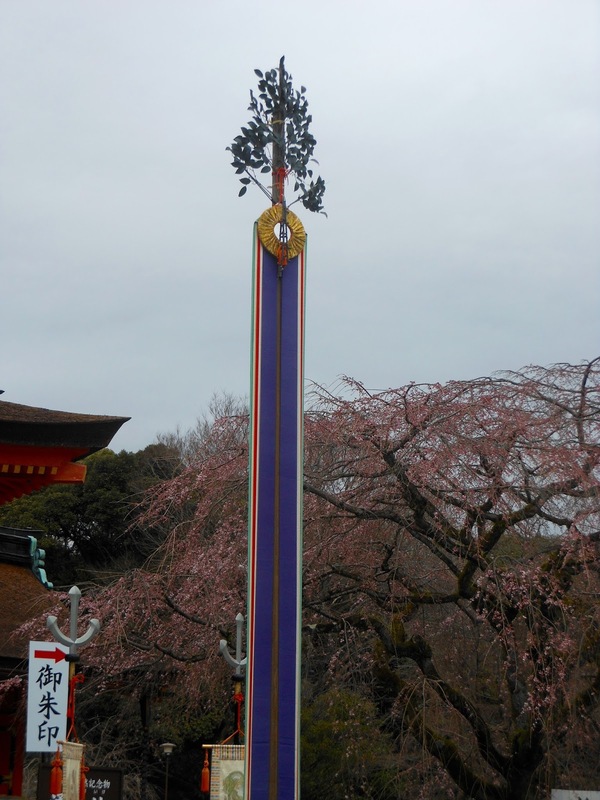 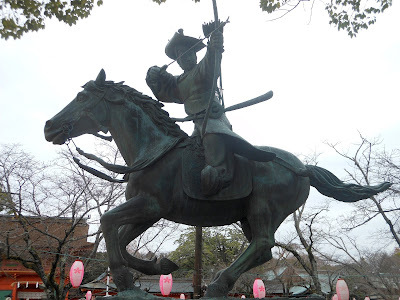 Every year on May 5th the shrine hosts a Yabusame competition. 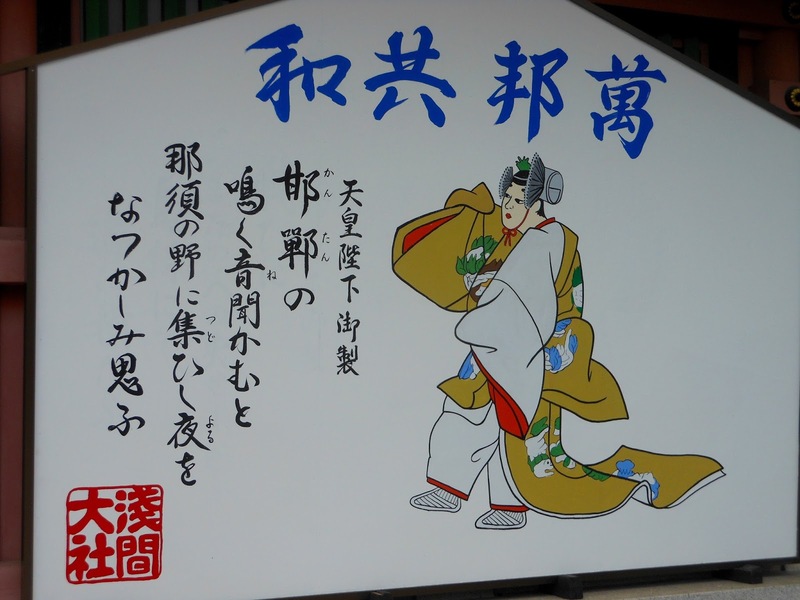 I am very interested in attending this after having recently seen Yabusame at Odawara Castle. 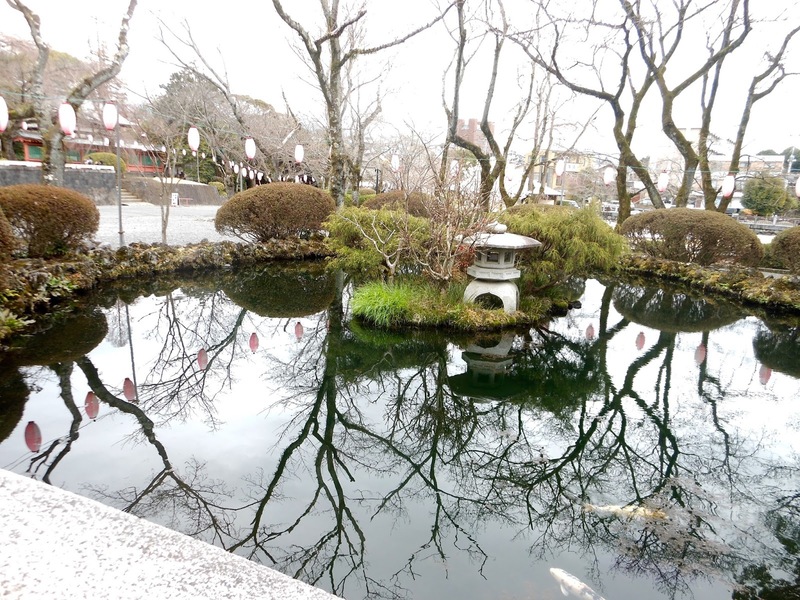 This is Kagami pond and on a clear day, Mt. 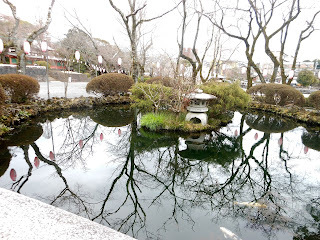 Fuji's reflection can be seen here. 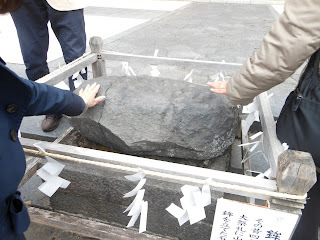 This rock is Hokotate-ishi and is a power spot. 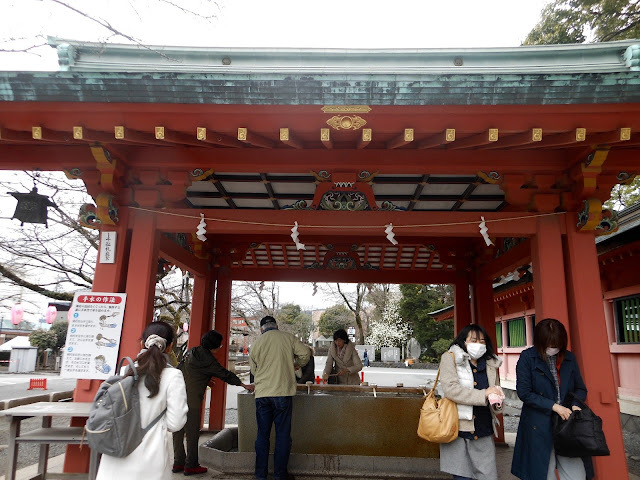 Before entering the shrine area, a purification ritual is done here, washing hands. 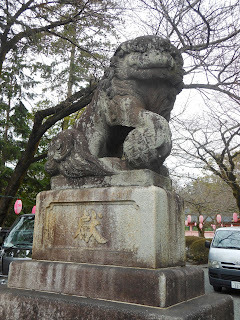 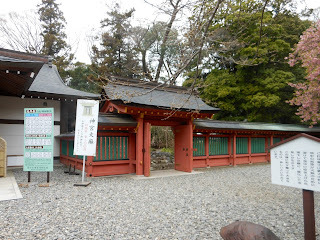 These buildings were donated by General Tokugawa Ieyasu at the beginning of the Edo period. 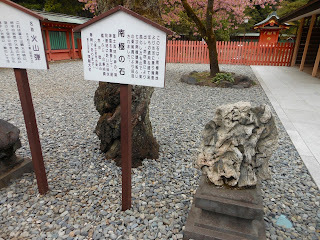 There are two stones displayed. The one above was a volcanic stone that was ejected into the air during an eruption of Mt. Fuji. It weighs about 100 kg. 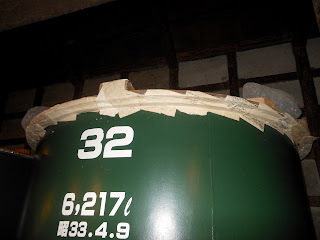 The one pictured below is from the South Pole and was dedicated by the Antarctic Vessel Crew from Fujinomiya City after they returned home safely. This unique two story shrine building is called Sengen-zukuri and is a National Important Cultural Property. 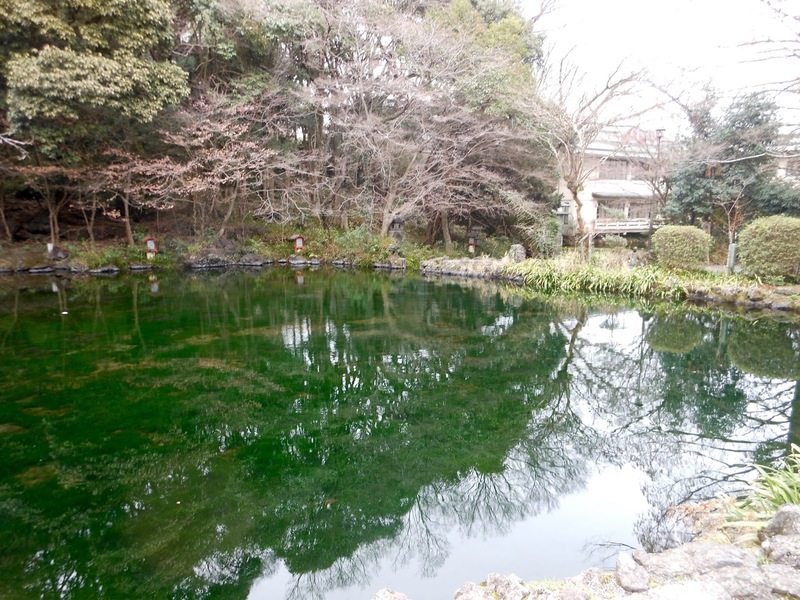 Wakutama Pond used to be a place for Mt. 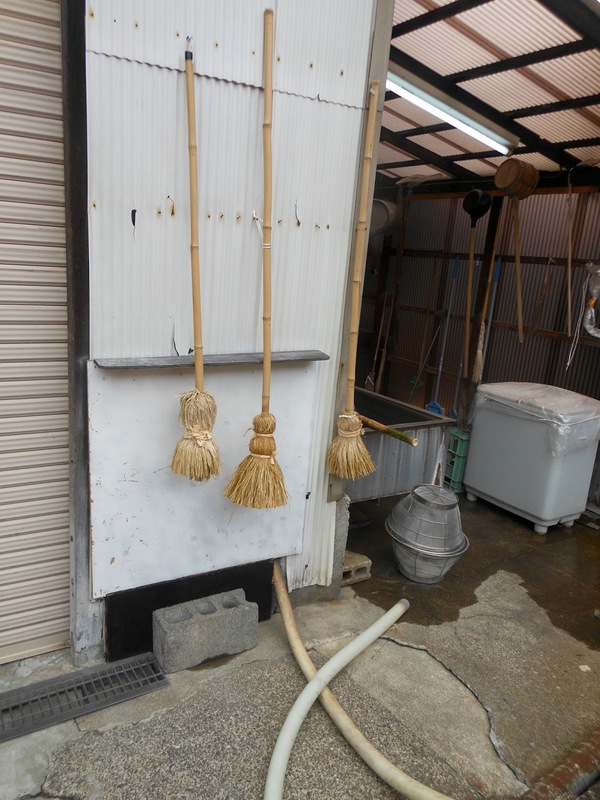 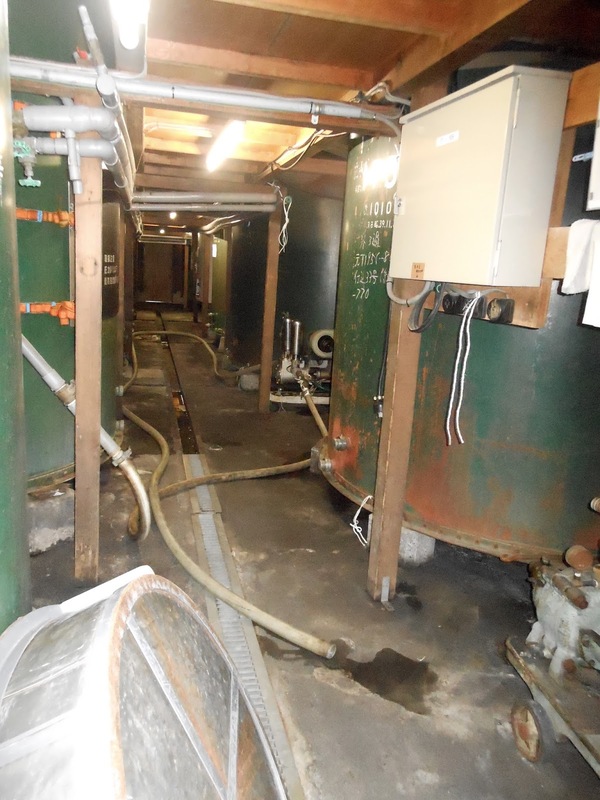 Fuji climbers to bathe and purify themselves in the 55 degree F water from Mt. 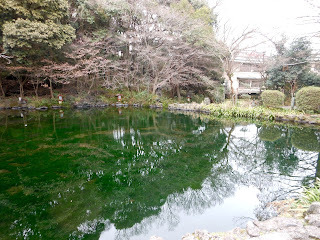 Fuji, but now it is prohibited to enter the pond. 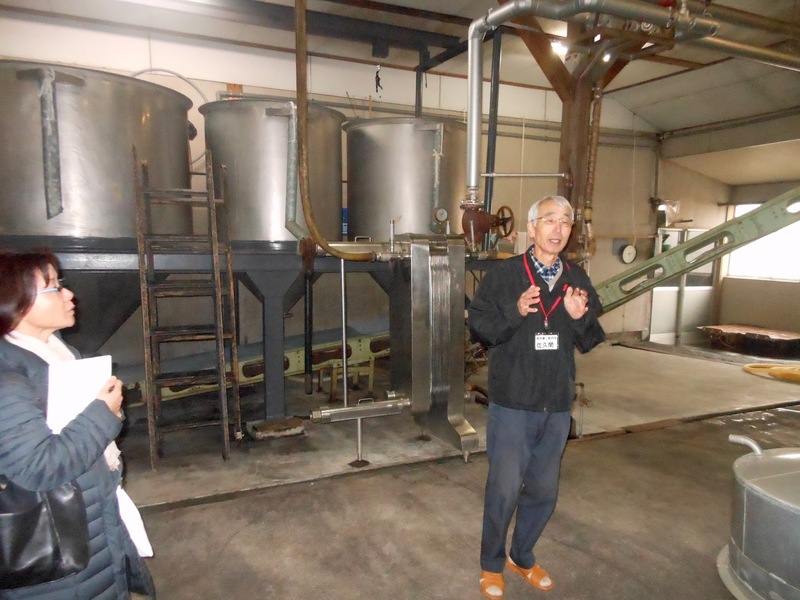 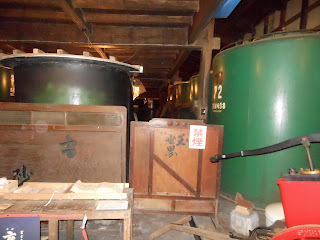 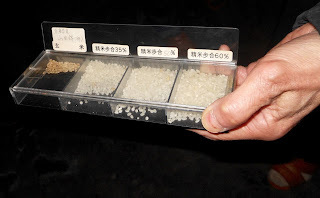 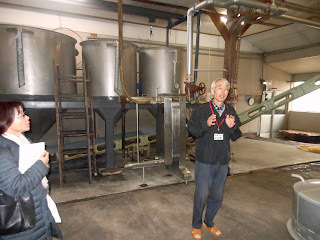 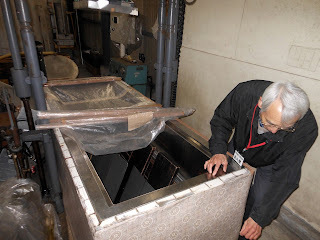 We were given a warm welcome and a wonderful tour of how sake is made! After the tour, a tasting of several kinds of sake was offered. 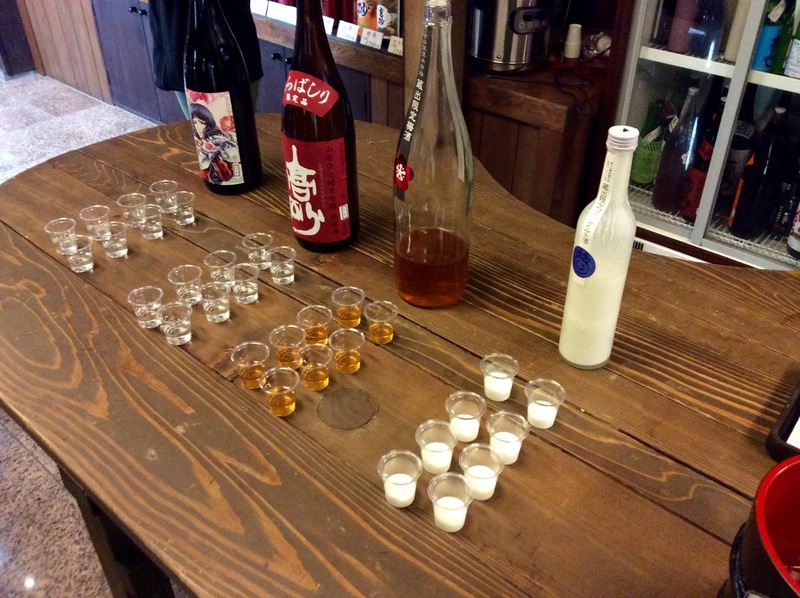 The white one is a yogurt sake and the one next to it is plum sake. 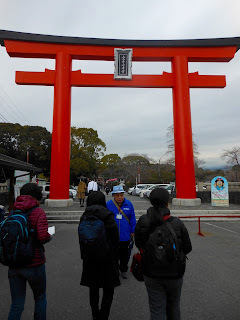 A big thank you to my guides and now friends! I hope to visit with you all again soon. 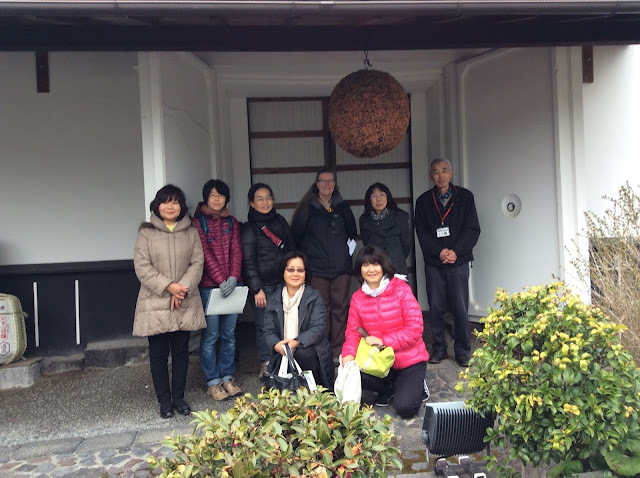 Wonderful day out with lots to see and learn. What are the brown packets hanging on the fencing around the old tree Pamela. 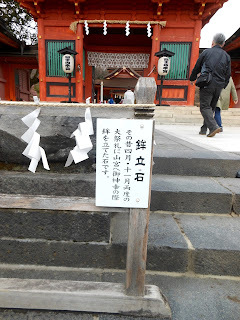 They are little wooden things for writing a message. You can buy them at the shrine. 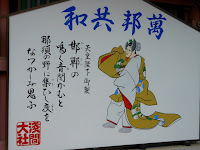 Here is a description from Wikipedia - https://en.m.wikipedia.org/wiki/Ema_(Shinto). 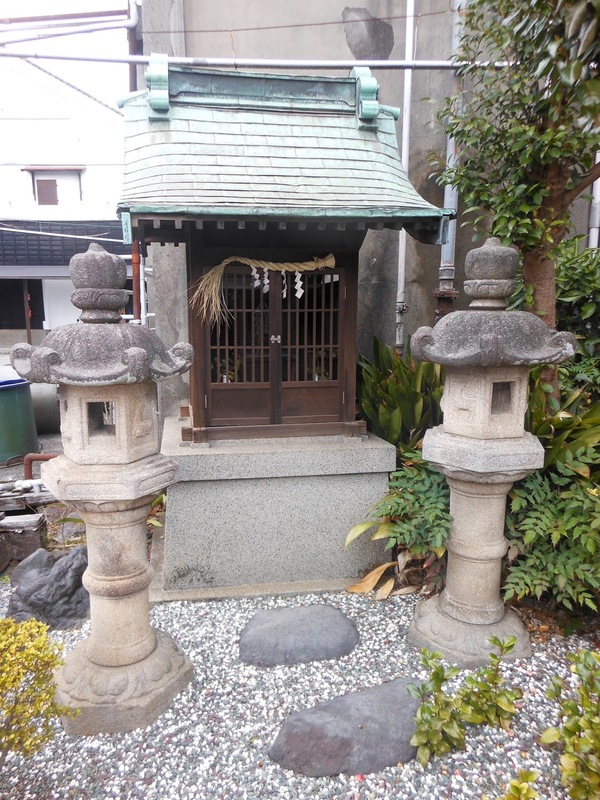 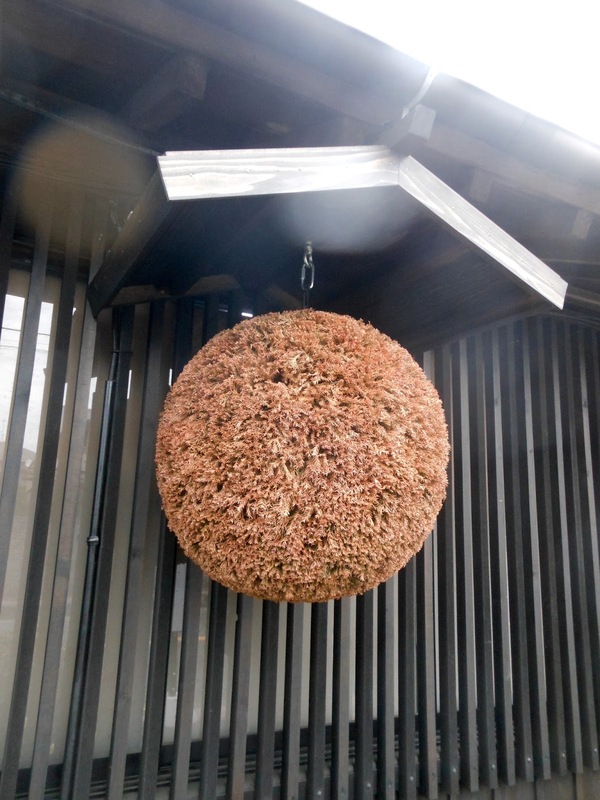 Sengen Zukuri is such an unusual shinto building. 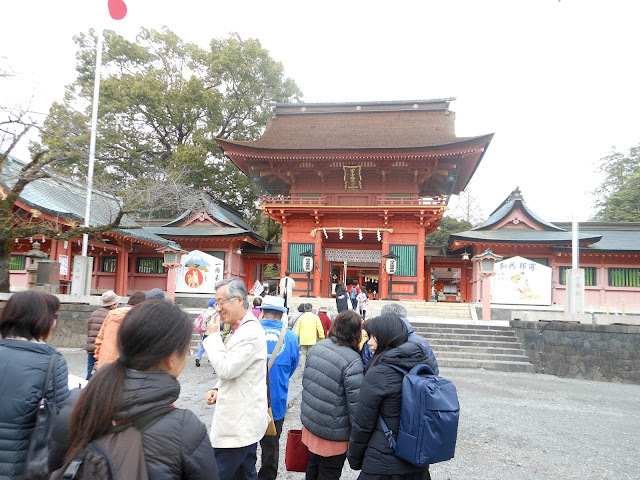 The red colour looks so cheerful. 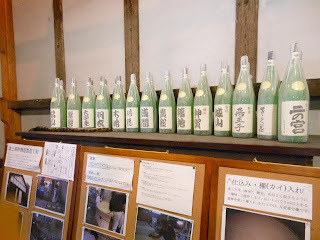 Which sake did you like best? 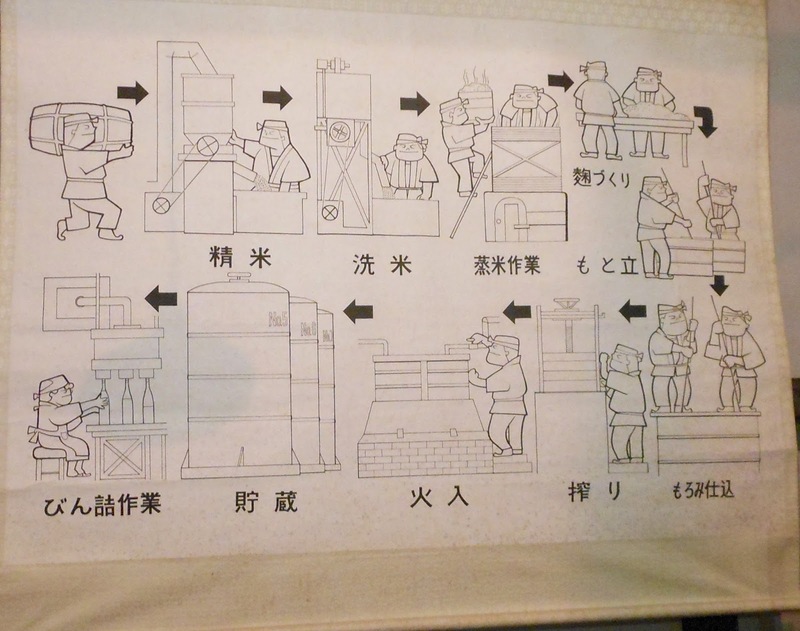 I had no idea there were such different varieties of sake. 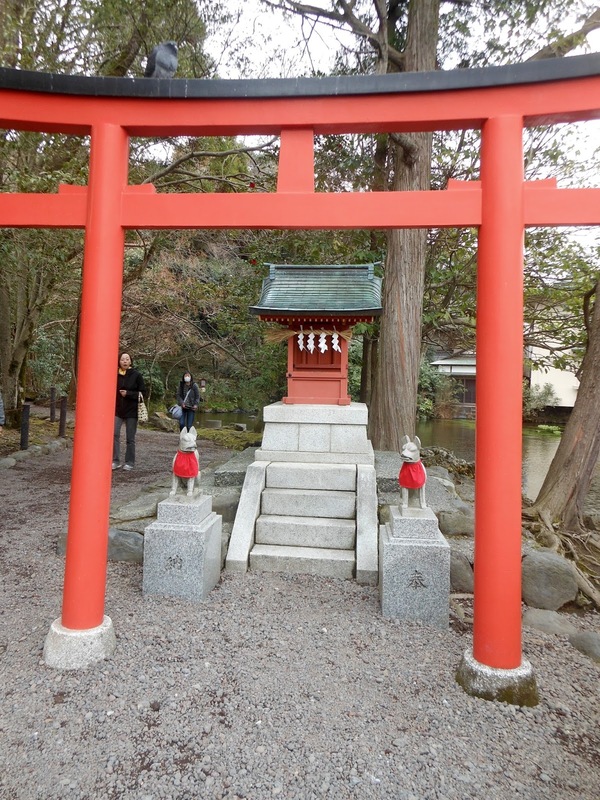 Another wonderful trip, and a beautiful shrine! That rocks looks small-ish to weigh 100kg, do you know what it's made of? 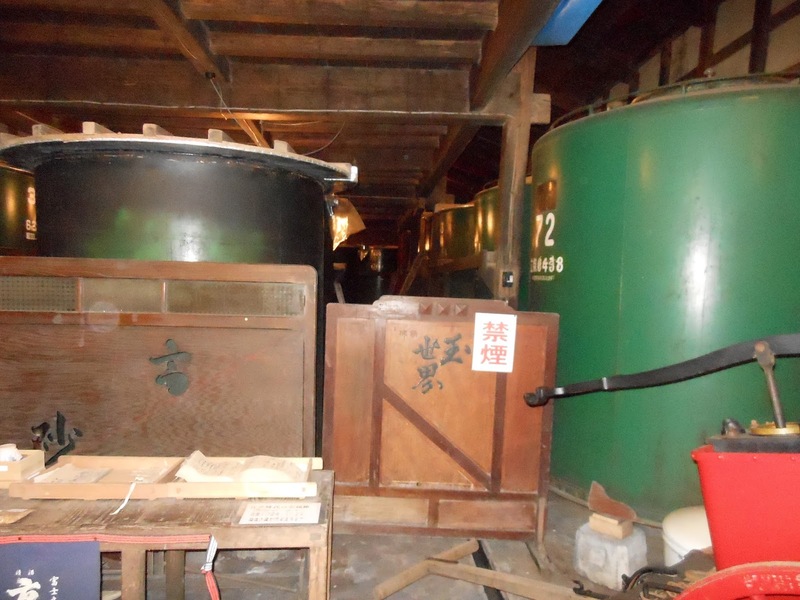 The sake brewery tour sounds interesting as well. I don't remember if you've talked about it as well, but do you enjoy sake? 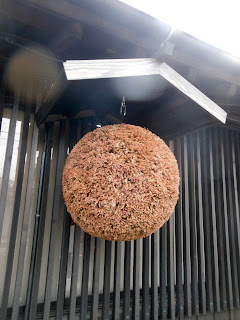 I've only tried it once, but didn't much like it. 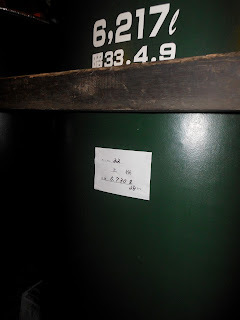 Maybe it wasn't very good sake, though.